Having been rather busy with the World Cup in the past couple of weeks, it's finally time for me to write a quick word on the latest movie I've watched. The toss up for my movie night was between Toy Story 3, The A-Team and the movie my friends and I ended up watching: Robin Hood. Having heard really good things about Toy Story, that would have been the movie of choice, but it would be better for my friends to take their kids there than a "guys' night out." The A-Team seemed to be a bit poor based on reviews, but spoke to us quite well as it was something we all enjoyed back in the day. Still... Robin Hood it was. I didn't know what to expect. I hardly read up on the movie at all before going due to time constraints - yes, it has something to do with the World Cup as mentioned earlier. I saw the trailer some time ago but didn't really think much of it. It was indeed something I would like to have seen during the year though. 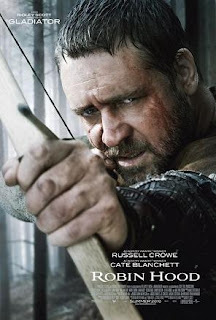 However, I do recall hearing something about Russell Crowe getting into some issues with the press when they attacked him for changing his accent half-way through the movie. Do you know what? I didn't notice it at all. The reason for that, I believe, is because the movie was so flowing and action packed that you just don't care if he decided to talk like an Indian (which he didn't, of course). I thought the movie was quite fantastic. It takes a very well established theme and pretty much turns it around so that it becomes nearly unrecognisable. You don't really get a chance to think what is really different because you are so drawn into the movie. There was some quite fantastic comedy bits in the movie, which was a bit uncharacteristic but well fitted anyways. You know what? It was a bit like one of those "Beginnings" movies (i.e. Batman Begins, Star Trek, etc), but it doesn't come across like one until you think a bit about it afterwards. Some of them do it well, like the two I mentioned, and some of them are just disastrous. Go watch it. It's worth it. It has something for everyone.